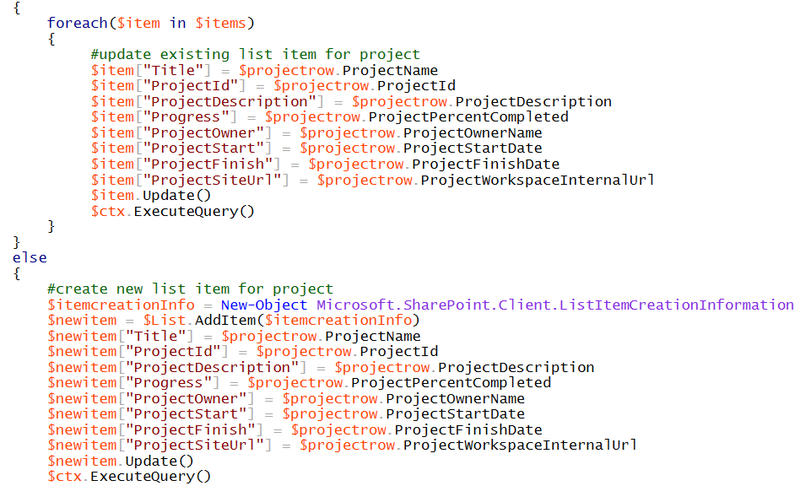 This PowerShell script will use the Project Reporting OData API to get all of the published projects in the Project Online PWA Site Collection, then for each project it will then create or update a list item on the specified SharePoint list. If the project has already been created on the SharePoint list on a previous run, the items will be updated rather than creating a new item.The user setting up the script will need to make some changes to the script, this is covered in the blog post. The account used will need access to the OData API in PWA and contribute access to the target SharePoint list. The SharePoint list will also need to be created beforehand with the required columns. Whilst the purpose of this script was to enable us to get the data into a SharePoint list and keep the data in sync for our PowerApp, it can be used for other purposes. For example, you could use this example script to modified the last script I published for HTLM fields to update existing items rather than creating new items each run. Do keep in mind that this SharePoint list would not be security trimmed like a Project Center view though, so you might want to restrict access to the SharePoint list depending on your data / security policies for your PPM data.